• St. Cloud State University’s Drew LeBlanc has won the 2013 Hobey Baker Award, presented in Pittsburgh’s CONSOL Energy Center on Friday, April 12, 2013. • Baker enlisted in the U.S. Army and became a commander of a flying squadron. • A month after World War I ended, Baker was killed in a plane crash on the day he was scheduled to return to the States. • Baker played one game in Pittsburgh on March 24, 1917. • Reserved tickets for the game at Pittsburgh’s Winter Garden cost 75-cents. • Chris Kunitz, Ty Conklin; goaltenders David Brown and John Curry, were all Hobey Baker Award finalists. Chad Johnston, a goaltender for Alaska Fairbanks and a fifth round pick by the Penguins in 2006 was also a Hobey Baker finalist. So prominently with his spurts up the ice and his defense tactics that he was the most conspicuous player on the ice. PITTSBURG DISPATCH, 1917 newspaper article describing Hobey Baker at a game at the Winter Garden. Hobey Baker, America’s greatest hockey player, played only one game in Pittsburgh. It was a grueling, multiple overtime game in which Baker saved the best for last. Tragically, his last may have been his best. Baker came to the Steel City in 1917 to play in an all-star hockey match that pitted an undefeated Pittsburgh squad against a Philadelphia team with Baker as the headliner. He was an athlete who defined grace, and one who possessed a pure natural ability in many sports. His agility and speed seemed supernatural to the casual observer. Baker’s talents emerged well before he dominated the ice and gridiron at Princeton, where he became a national sensation. Hobey Amory Hare Baker was born on January 15, 1892 in Bala Cynwyd, Pa. At age 11, he and his brother Thorton (Tommy) went to St. Paul’s School in Concord, N. H. and captured the fancy of hockey coach Malcolm Gordon. The baseball and football coaches shared equal bragging rights to Baker. Baker was given a full scholarship to Princeton where he lettered in football and hockey. Baker became the only athlete talented enough to be enshrined in both the College Football and Hockey Halls of Fame. In fact, Baker was inducted into the the very first class of the Hockey Hall in 1943. The NCAA’s Hobey Baker Award is college hockey’s equivalent of the Heisman Trophy and was named in his honor. According to John D. Davies’ The Legend of Hobey Baker, a teammate gushed over Baker’s talents: “He flew over the ice like a bird … I had seen pros play in Pittsburgh where I had first played hockey, but I had never seen such speed or grace.” Before he graduated from Princeton in 1914, he helped lead the Tigers to a record of 27-7. He played the position of rover and his stamina was remarkable. During a loss to Harvard in January 1914, Baker played 40 minutes of regulation and an additional 23 minutes of overtime without substitution. After graduation Baker moved to New York and went to work with J.P. Morgan on Wall Street and played occasional games for St. Nicholas Club, a Manhatten-based team comprised mostly of Ivy League grads, and later with an “aggregation” or all-star team based in Philadelphia. He joined the civilian air corps in 1916 and became enthralled by flying. While on a training flight, he buzzed the over Princeton’s football field flying so low over the stadium that the crowd roared when they recognized the familiar pilot. World War I escalated into its third year and Baker started the process of enlisting in the service. Baker brought a team of all-stars into Pittsburgh to play the Young Mens Business Club, engaging in a memorable exhibition game at the Winter Garden on March 24, 1917. The unbeaten Pittsburgh team was composed of ex-college letterman from big eastern schools. Pittsburgh’s defenders were well prepared to face Baker. Chislett in goal, Patterson at point and Garrison at cover, all were Princeton stars. Marsh Herron, a standout at Yale, played opposite of Baker at rover. Baker’s team had some familiar faces: ex-Princeton goalie Ford, and coverpoint Hill from Cornell and Baker’s younger brother Tommy. The match was hyped by all of the local newspapers and the promoters reserved 1,000 seats costing 75-cents to see the Saturday evening tilt. The game started at 8:15 pm and the Winter Garden was packed to capacity. The Pittsburgh septet, made mostly of all-stars of the Pittsburgh Amateur League, held Baker and company in check for most of the game. The Winter Garden’s 300 x 140 feet surface was the largest rink in the world, but didn’t hamper Baker, who was accustomed to playing in rinks half that size. “Even the large ice at the Winter Garden did not deter him. The extra space made him even more noticable,” noted Â The Pittsburg Press. Baker scored all three Philadelphia goals, including a the winner in the third overtime. ?Baker opened the scoring after he skated through the entire Pittsburgh team an slip a puck past Pittsburgh goalie Chislett. Baker controlled the puck at will and every time he touched the puck, cries of “Here he comes,” filled the Garden. Pittsburgh’s Marsh Herron evened the score at one near the end of the first half (two twenty minute periods were scheduled). Jack Barbour scored for Pittsburgh early in the second half. 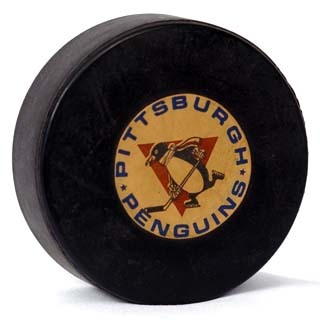 It looked like the Pittsburghers were about to pad the lead by peppering Philadelphia goalie Ford with a dozen shots. Baker scooped up a rebound and headed into the Pittsburgh zone to tie the game at two. Two extra five minute periods didn’t produce a winner. Baker, on a rush that started behind his own net, scored nearly ten minutes into sudden death overtime to win the match. “The locals clearly outplayed the vistors, the individual work of Baker, coupled with some clever goaltending on the part of Ford,” was the difference according to The Pittsburgh Dispatch. When Baker and his teammates were leaving the Pennsylvanian station the next morning a banner headline (ABOVE) detailed the epic battle from the previous evening, but the front page headline had more of an ominous tone: WAR DEPARTMENT ACTIVATES NATIONAL GUARD UNITS. The United States declared war on Germany on April 6, 1917 and one month later Baker was a lieutenant in the U.S. Army. Baker was off to France in August and began to fly for the Lafayette Escdrille, or 103 Aero Squadron, in December. As the war entered its final years, flying missions were less combative. Baker was engaged in limited action and had three kills. In August 1918, Baker was promoted to captain and led the 141st squadron in Toul, France. The war ended three months later. Baker was scheduled to leave for home on December 21, 1918. Despite being urged by his squad not to tempt fate, Baker decided to take a test flight in a recently repaired plane. Shortly after takeoff, the Spad’s engine sputtered and stalled. Baker couldn’t overcome the loss of lift speed as the plane crashed nose-first close to the landing strip. The Great American hero was dead at age 26.